All transactions are safe and secure with a reliable history in online purchasing behind each of our associates. Buy the Jigsaw Tricycle t-shirt to own Saw clothing and merchandise. This Jigsaw Tricycle shirt shows the fun side of the killer. However, if you enjoy watching Jigsaw helpless and in pain like his victims usually are, then Saw 3 was probably your favorite Saw movie. As he struggles for his life, his skull is drilled wide open with power tools in hopes of keeping him alive just long enough to see his game finish. With Jigsaw keeping secrets, it ends not only in his death but in deaths of others. 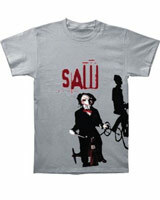 Pair it with the other Saw Jigsaw t-shirt that also displays the killer's puppet. In addition to the Jigsaw Tricycle tee above, browse the Saw Clothing Gallery for more apparel like men's and women's clothes, kids shirts or hoodies.